As if adding a flash to your digital SLR wasn't complicated enough, now I'm going to introduce you to the range of flash diffusers and reflectors that you can add on to your FLASH. Before your palms start to sweat at the thought of yet one more camera accessory, please realize that diffusers and reflectors are really for advanced flash photography. If you never see yourself getting really intimate with the controls of your digital SLR flash, and can't imagine that you'll ever use something like a wireless trigger, then flash diffusers and reflectors are probably way more gear than you really need. But for those who want to take their flash photography to the next level, some of the modifiers that I talk about in the page that follows are essential. 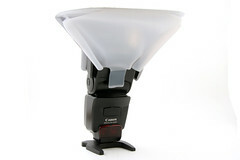 The most basic of all the flash modifiers are small diffusers for external flash units. These flash add-ons are designed to soften the light emitted by your external flash by spreading the light out over a wider surface area. They are made of a translucent material (typically white) and fit over the top of the flash. The hard plastic shell is a relatively inexpensive and easy way to add some diffusion to your flash if you only have one external flash unit. The soft plastic frames come in a much wider variety of shapes and sizes and work well if you own several different flash units and want one diffuser that will work with all of them. The pliable diffusers are also a better bet if you REALLY want to diffuse the flash since they are able to spread out the light more than the hard plastic shells. Some of the soft plastic diffusers are also reflectors at the same time - allowing you to point your flash straight up while reflecting the light from the flash toward the subject in front of you. These two types of flash diffusers don't work very well with a flash unit attached to your camera. Instead, they are designed for a flash unit that's mounted to a light stand - which means that you're using a special trigger (wired or wireless) to set off the flash. Umbrellas and softboxes are just two more tools that you can use to spread out the light emitted by your flash. Umbrellas are aptly named - although I wouldn't reccommend using them in a torrential downpour. The nice thing about umbrellas is that many of them are dual purpose reflectors and diffusors. The interior of the umbrella is either a white or silver material designed to reflect light, while the exterior is a black material that blocks the passage of light. When the flash is fired INTO the umbrella, the material reflects the light, effectively increasing the size of the flash and providing you with more alterative ways to light your subject. Some umbrellas let you remove the black material from the outside of the umbrella. You can then turn the umbrella around, and shoot the flash THROUGH it. When you do this, the white material of the umbrella diffuses the light from your flash, creating a nice even light for a wide variety of portrait subjects. Umbrellas can easily be used with small external flash units with the addition of an inexpensive umbrella mount that you attach to the top of a light stand. More expensive studio strobe lights come with their own umbrella mounting holes. Softboxes are really just special diffusers and are so named because the majority are shaped like a square. Unlike umbrellas, softboxes are fitted over the flash head, completely enclosing it. It's also quite rare to see softboxes used in conjunction with small external flash units - softbox connectors are designed to work in conjunction with studio strobes. Softboxes come in a huge range of sizes (allowing you to have small or enormous diffuse light sources) and also in a variety of shapes from pure squares to long rectancles (also somtimes referred to as strip lights). A softbox is ideal for creating low-contrast portrait lighting, and you'll often see them used in professional studio setups. The gigantic sofboxes are used to photograph large groups of people, where you want everyone in the group to appear evenly lit. 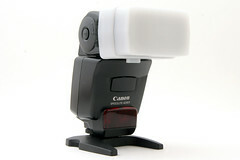 This effect can also be achieved with multiple flash units and multiple softboxes. One notable exception to the gigantic class of softboxes is the XXXXX - it's a tiny softbox that can be used to diffuse an external flash unit even when the unit is attached to your digital SLR camera. While you can certainly diffuse the output from your flash at the source, another world of photographic opportunities opens up when you consider how the flash can be bounced and reflected onto your subject. For this exact need, there are reflector discs. These large circles can be folded up into a relatively compact shape, and they often include a variety of colored surfaces you can use to reflect light including: white, black, silver and gold. Rather than firing the flash through the disc (as you might with a softbox or umbrella) you fire the flash TOWARD it and use the reflected light to illuminate your subject. Sounds a lot like using an umbrella doesn't it? Well, there's another use for reflectors that make them useful for the flash photographer on a budget: you can leverage the reflected light to act as a second light source. Imagine that you're taking a portrait of a friend and you have your one external flash unit set up on a light stand (no umbrella or softbox) to the left of the camera. The direct light from the flash creates hard shadows on your friend's face. You'd like to add a little more light to the shadow side of the face so that the one eye is not lost in shadow. While you could certainly add another flash to illuminate the face from the other side, you can also just position a reflector so that it bounces some of the light emitted by the flash into the shadow side of your friend's face. Voila! You've just created an image with less contrast without having to spend the money on a secondary flash. Like umbrellas, some of these reflectors can be used as both reflectors and diffusers - you just have to remove the reflective bag from the outside of the disc, and then it becomes a giant circular diffuser. One of the nice things about reflector discs is that they're not just limited to flash photography (while umbrellas and softboxes are). You can use the same reflector and/or diffuser when working with natural sunlight if you want to change the quantity and quality of the light that's landing on your subject. Now we're really getting into some esoteric flash modifiers, but it's worth going over what they are and what they can do. 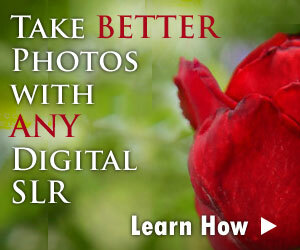 You might just find that one of these modifiers is exactly what you need to enhance your flash photography. I'll talk about snoots and grid spots first, since both modify the light output from the flash in a similar fashion. A snoot is a long tube that fits over the top of the flash and essentially turns it into a spotlight. Rather than spreading the light out like a diffuser, the snoot focuses the light into a narrow beam, allowing you to light your subject precisely. A grid spot is a similar device and has the appearance of a honeycomb grid. This grid reduces the range of the light output from the flash and the professional models allow you to control the circle of light landing on your subject (measured in degrees). Multiple flash units fitted with multiple grid spots allow for very controlled lighting in environments where the natural light is less than ideal. Needless to say, any setup that includes multiple lights and either snoots or grid spots is going to cost a pretty penny. Who says that light emitted by you flash must always be white? There's no need for it to be, and that's where gels come in. Gels are colored pieces of transparent material that fit over the front of your flash head (some flashes come with special holders for gels). In the days of film, you could use gels with a flash to adjust for color tints in your photos (these gels would "correct" the color in your images). Since color correction is handled by digital SLR cameras in the form of the white balance setting, gels are more of a special effect when used with a digital SLR. They allow you to add a wide range of colors to your flash, and are most often used to add some color and interest to a background. This is not to say, however, that you can't use a green gel on your flash to give all of your portrait subjects that just-landed-from-Mars look.